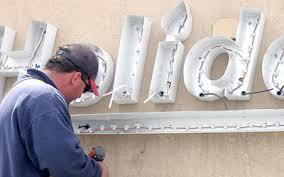 Many older signs contain lighting that is not very energy efficient. If you have an older sign and you want to refresh it for the modern age, let the team at Greenfield Signs & Lighting retrofit your signs and breathe new life into your old signs. Retrofitting lighted business signs will attract more attention for your business than your old signs, and with retrofits, you won’t have to worry about wasting energy anymore. Using LEDs to retrofit signs is a great way to improve your business, and once you make your exterior outdoor lighted signs more modern, you can rely on them for years to come. By choosing to retrofit your existing signage, you can marry the old world and new, keeping your classic look and making it more appealing for today’s audiences. Call 866-740-9797 or email phil@greenfieldsigns.com today and see how we can help your business.